Congratulations to the 64th Emmy awards nominees & winners! 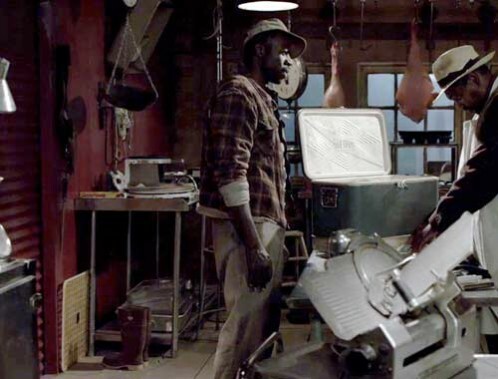 Sets in these episodic television series gave a physical reality to imaginative storylines or established a time period without being confined by it. 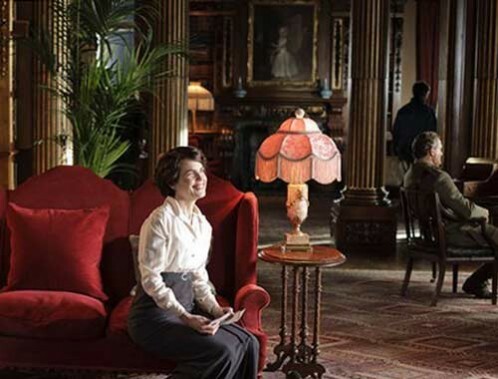 World War I comes to the sprawling Yorkshire estate of DOWNTON ABBEY, which is transformed into a convalescent home for wounded officers. The effects of the war on British society are revealed, from rationing to change of staff and priorities, as men of all stations go to war. When the war ends, the aristocratic house is reverted to its former state, but Christmas arrives without the usual merriment and the pall hangs over the annual New Year’s Shooting Party. The war years of 1917 to 1919 have caused vast change. Elizabeth McGovern. Photo by Nick Briggs ©2011 PBS. All rights reserved. The wild-west is alive today in the hollers of Kentucky, as vividly portrayed in the risky drama JUSTIFIED. The sets are as realistic as the intense personalities and interfamily feuds that explode in the deep rural environs and town of Harlan. This season, one of the main families is run out of town, more holler abodes are unveiled, including trailers and crack houses, there’s a new jail, the loner sheriff moves into an apartment above a new bar…and a popular BBQ joint that has thrived in the sticks for generations happens to also be handy for disposing human remains! Demetrius Gorsse, Mykelti Williamson. Photo by Prashant Gupta ©2012 FX. All rights reserved. 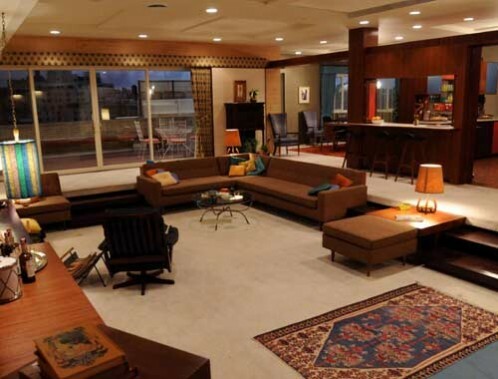 1966 ushers in a stylish Manhattan apartment for Don Draper and his new wife, and a variety of parties: an award banquet for Don, LSD for Roger at the home of intellectuals, Peggy serving dinner in her small apartment, Pete and his wife hosting in the suburbs…Betty deals with the threat of cancer…Joan has her baby and a divorce…amidst all the business maneuverings, personal manipulations and dalliances involved with Sterling Cooper Draper Pryce and its staff. As the year 1967 unfolds, shockers include Peggy joining the rival firm. This category ranges from sitcoms and romantic comedies to a reality/contest series. Reality/contest HELL’S KITCHEN has some unusual parameters: the restaurant and kitchen sets are built on stage, the housing in an office structure, and all become live sets for the season! The professional 2-story kitchen offers a viewing balcony for judges, the restaurant serves 115. The contestant living quarters have furnishings custom-designed for common space areas and bedrooms color-coded for each team. Numerous 2-way mirrors hide cameras, yet details make the spaces friendly and offer a refuge from the intensity on stage. Photo© All rights reserved. Not for reprint or reuse. 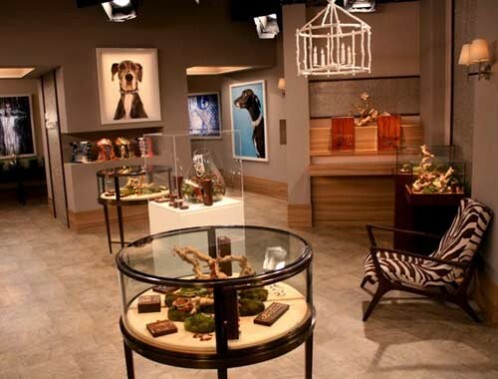 Much was revealed in this season’s continuing love-story-in-reverse HOW I MET YOUR MOTHER…including new sets galore! 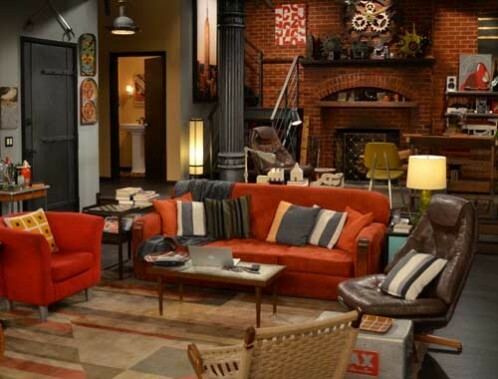 The most significant is Ted’s new loft apartment, where he finally gets to create and live in his own world. As always for this team, the range and depth of the design and decoration belie the half-hour time slot, and the 7th season still maintains a fresh, creative energy translated immediately through richly layered, artful and witty sets. The angst and joys of a wedding…yoga class for distress and to fit into THE dress, friends’ and relatives’ homes, romantic dinner & other plans gone awry, and the church ceremony finale…quite a sophomore season for the romantic comedy MIKE & MOLLY…and for the design and decor team creating with loving detail the working class environs of a Chicago police officer and an elementary school teacher, and the lives surrounding them. Billy Gardell, Melissa McCarthy. Photo by Sonja Flemming ©2011 CBS. All rights reserved. Two roommates from opposite backgrounds resourcefully and artfully share a tiny Brooklyn apartment and a dream to own their own cupcake shop. Humor is not just scripted in 2 BROKE GIRLS…winks and nods appear in many of the sets, from the very tasteful to the deliciously playful, from rich and urbane to diner-tique, with the unerring eye of a seasoned and whimsical team. The vast span of this category ranges from biography to horror. A therapist and his family move into a restored mansion, unaware that the home is haunted by its former inhabitants. 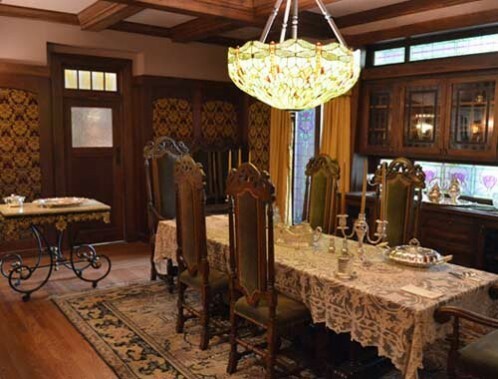 The horrors of the house include a history of over 20 murders throughout decades, from the 1920s to present day. 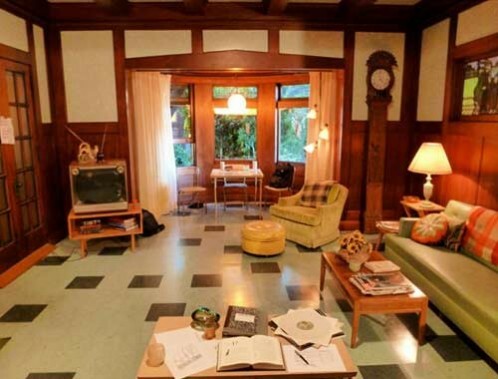 Part 1 of AMERICAN HORROR STORY establishes the original home and some of the new renovations that kept many of the architectural features intact, although the inhabitants rarely remained so! The horrors continue, as do the reincarnations of the house, as diverse as the different time periods of its various residents, who are depicted in their corporeal eras as well as in their current ephemeral state. Time warps constantly in this house…as we discover more about its occupants, the neighbors and their environments, and the community. Ernest Hemingway and Martha Gellhorn’s tempestuous relationship spanned decades and continents: Key West, the Spanish Civil war, their home in Cuba, his Idaho cabin, her London apartment, and various conflicts, both personal and national, throughout the world, including Great Britain and Europe during World War II and the emerging nationalism of China. Sets were created to be integrated seamlessly with actual footage from the times…emphasizing both accuracy and artistry. Nicole Kidman, Clive Owens. Photo by Karen Ballard ©2012 HBO. All rights reserved. 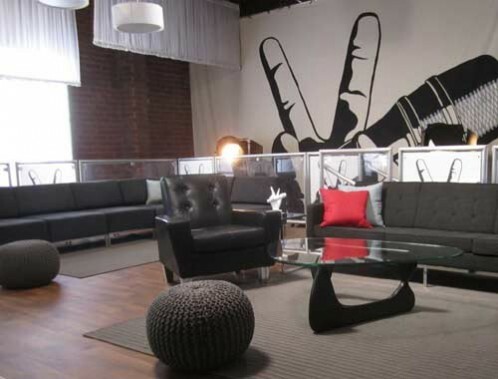 The breakout music talent show THE VOICE consists of three phases: a blind audition, a battle phase and live performance shows. Four judges/coaches, all noteworthy recording artists, choose teams of contestants through a blind audition process, and then coach them through the other phases of the competition. Backstage areas, audition rooms, lounges and an amphitheater-like stage boldly establish the show’s presence, but enhance rather than overreach the performances.